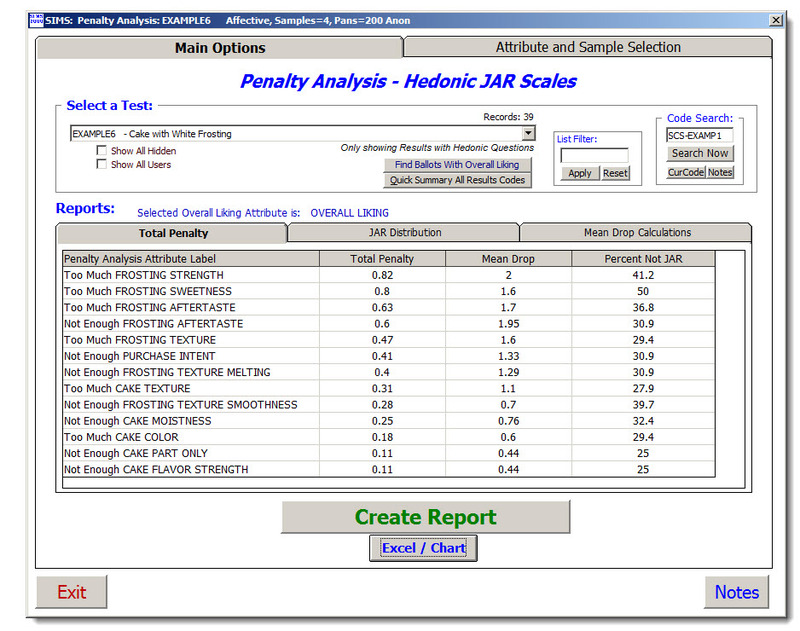 Penalty analysis is a method used in sensory data analysis to identify potential directions for the improvement of products, i.e. Overall Liking, on the basis of the other sensory attributes presented to consumers or experts. Example SIMS Excel Export Screen - Total Penalty. Example SIMS Excel Export Screen - JAR Distribution. 1. 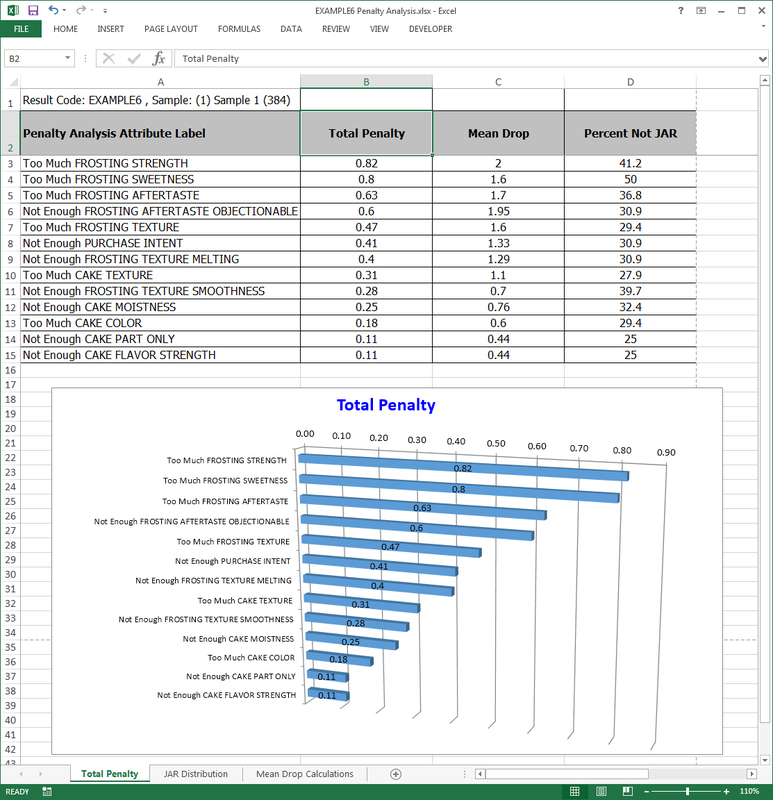 Example SIMS Excel Export Screen - Total Penalty. 2. 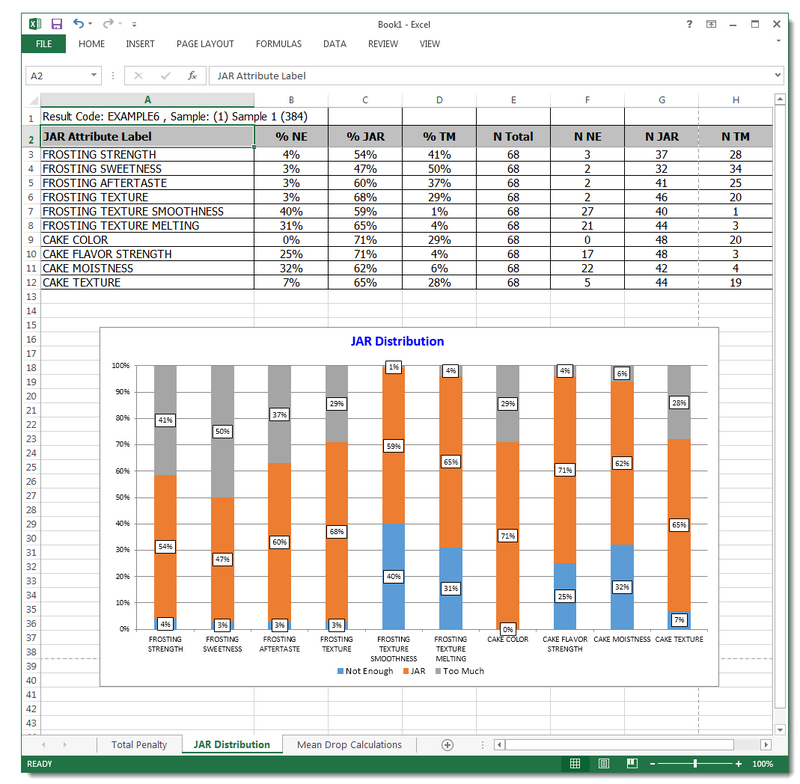 Example SIMS Excel Export Screen - JAR Distribution. 4. Notes that will be available by Clicking the 'Notes' Button on Main Report Form. presented to consumers or experts. the ratings of those consumers indicating that the JAR attribute was Just About Right (JAR). a) An Overall Liking attribute for the global satisfaction index for a product/sample. Typically this Overall Liking attribute would be a standard 9 point scale. b) One or more JAR attributes for individual characteristics of the product. Typically these JAR scales are a standard 5 point scale. Penalty analysis shows the amount that the Overall Liking was penalized by the Not-JAR respondents. The Overall Liking score would increase by the Total Penalty. 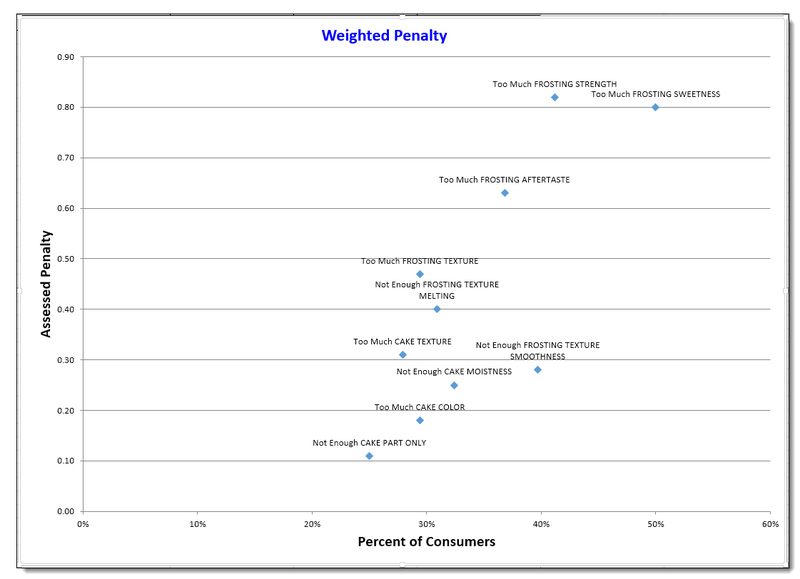 The JARs with the larger values for Total Penalty may be of interest. The graph values, units of measure, will depend on questionnaire design and panelist's data. a JAR with a total penalty > 0.50 is high and > 0.25 is noteworthy. Interpretation is the responsibility of the Sensory professional taking all aspects into account. - Studies with Overall Liking and JAR scales. - Monadic or multi-sample studies. One or more samples. - More valuable with larger test populations (N). - More valuable when parallel description sensory data is available. You may need to manually select the proper attribute for your ballots 'Overall Liking', see 2nd Tab. JAR scales must be Hedonic attribute types. Line Scale types are not supported. JAR scales must have an ODD number categories. The middle category is assumed to be JAR. JAR scales actual Not-JAR responses must be >= 20% to be included, in either direction, NE or TM. JAR scales Mean-drop calculation must be > 0 to be included. FAQ: Where is my JAR question? Hint: Is your JAR question a *Hedonic* question type in SIMS? Line Scale types are not supported. Hint: JAR scales actual Not-JAR responses must be >= 20% to be included, in either direction, NE or TM. This is the JAR Distribution Graph on the JAR Distribution tab in Excel. A stacked bar graph. N Counts are more common. Rarely used option. Lowers the JAR scales Not-JAR responses to only 5% instead of the normal >= 20% to be included on the report. SIMS penalty analysis calculations are simple mathematics. SAS software is not required. The mathematic specifications per Tom Carr, 2007. The qualified and selected JAR scales are independently analyzed with overall liking. Collapse the JAR scale responses by --Panelists-- into three, NE, JAR, and TM. Calculate the % of panelists for the JAR scale for the two non-JAR groups, NE and TM. Google search on the Internet. Try searching for:  Sensory "Penalty Analysis"